One place for everyone’s details. 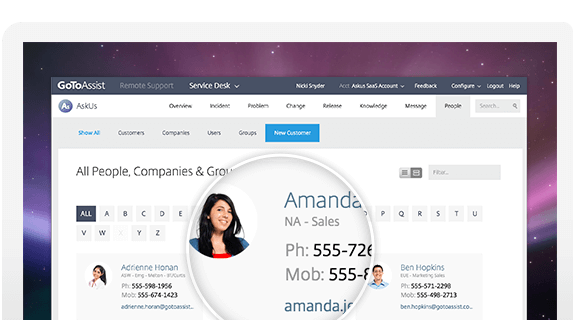 Your contacts are people involved with your services, including admins, users, customers and employees. Service Desk lets you catalogue everyone together in one database for quick access to their personal information. Service Desk allows you to set access levels for both technicians and customers. Technicians log in with their own credentials, and they can manage only the services you want them to. 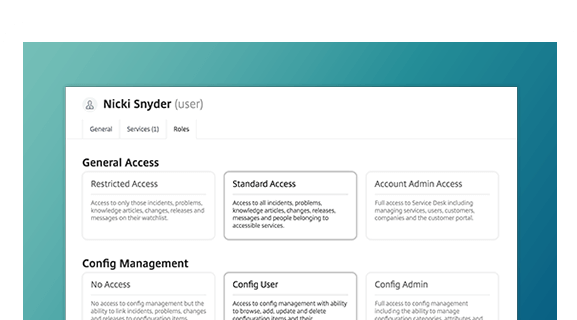 For customers, you can enable access to your online help portal so they can easily submit incidents and read knowledge articles. Not every customer is created equal. If you have customers who need to see more than just their own tickets in the online portal, you can simply adjust their access. Give them complete visibility so they can see all of their company’s incidents. Or take it a step further by granting them admin privileges to manage their company’s users who have access to your portal. Keeping information close at hand. Service Desk provides your customer’s information right in the incidents that affect them. You can see his or her name, number, address and more at a glance. And if the customer has submitted other issues, that information is retained for review as well. You can track all of the interactions this customer has had with your support services. Reduce call volume by helping customers answer their own questions.